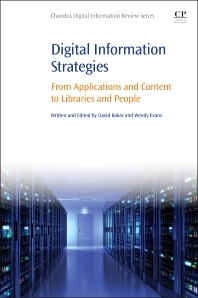 Digital Information Strategies: From Applications and Content to Libraries and People provides a summary and summation of key themes, advances, and trends in all aspects of digital information at the present time. This helpful resource explores the impact of developing technologies on the information world. Written from an international perspective, the book emphasizes key current topics and future developments. The publication is based on a dynamic set of contents that respond to, and anticipate, what is happening—and what may well happen—in the field of digital information. All those involved in digital information provision, library development and digital collections and services (whether or not library based), including managers, subject specialists, project directors, technical staff, content creators and editors. Researchers, lecturers and students of library and information science and students, researchers and lecturers of the Internet and of digital provision. Conclusions: To Lead or be Led? Introduction: What Makes a Great Research Library? Chapter 5. Digital Research Data: Where are we Now? What is Data and what Constitutes Big Data? Chapter 8. Peopleâ€™s Technology: Where is the Line? A New Model of Collection?